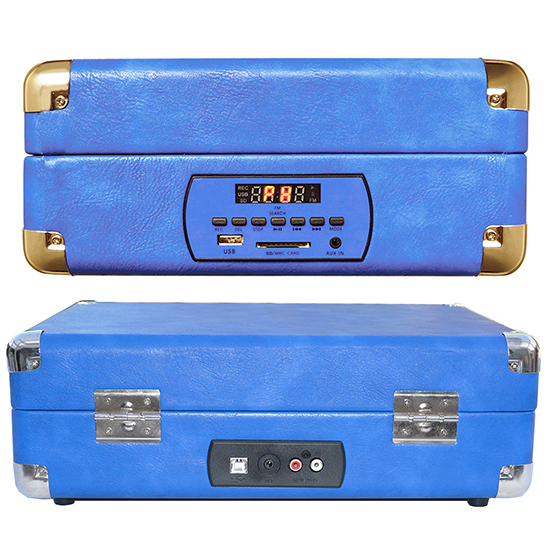 Boytone BT-101BL Bluetooth Turntable Briefcase Record player AC-DC, Built in Rechargeable Battery, 2 Stereo Speakers 3-speed, LCD Display, FM Radio, USB/SD,RCA, AUX / MP3, Encoding, 110/220 Volt. 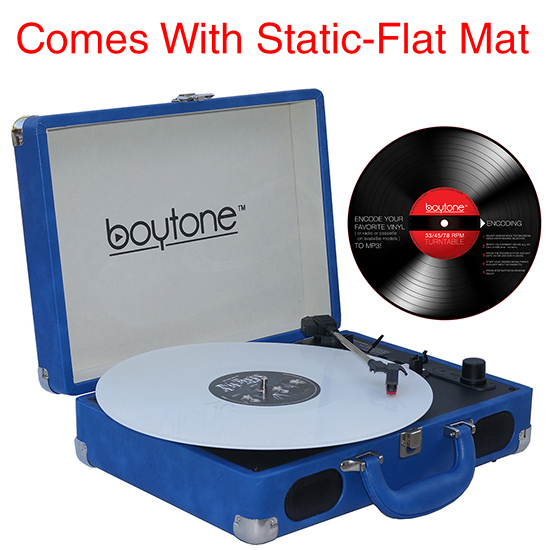 Boytone BT-101BL 6-in-1 Briefcase Turntable contains a great portable briefcase styled record player (turntable) which is easily transported. 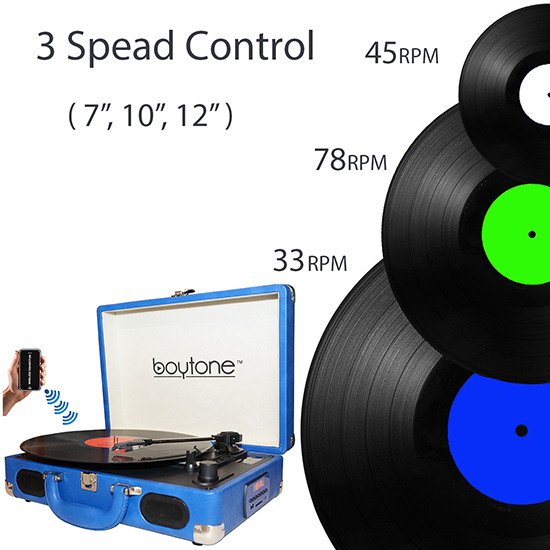 Ability to convert vinyl records, FM Radio into MP3 files format without a computer or any programing. This amazing system comes with modern technology. It also includes a belt driven turntable mechanism and an auto stop switch. This player does it all! 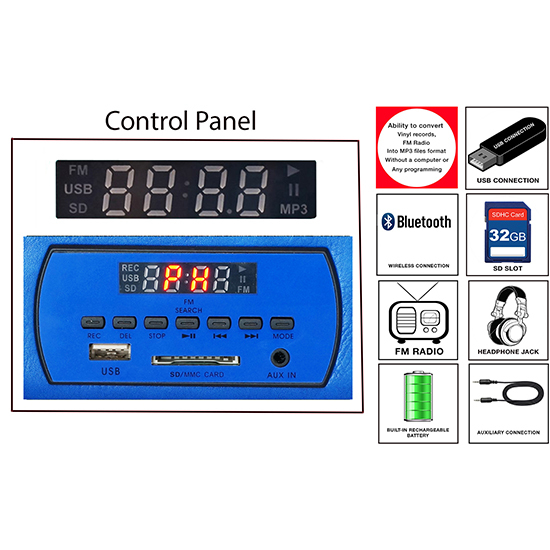 3 Speed Selectable (33/45/78 RPM) speeds settings, AC-DC built in rechargeable battery (110V & 220V UL) dual voltage which allows you to take our product worldwide, digital MP3 playback with USB and SD cards, FM radio, digital display with frequency (FM 88 MHz - 108 MHz,), 2 built-in speakers and rotary knobs . 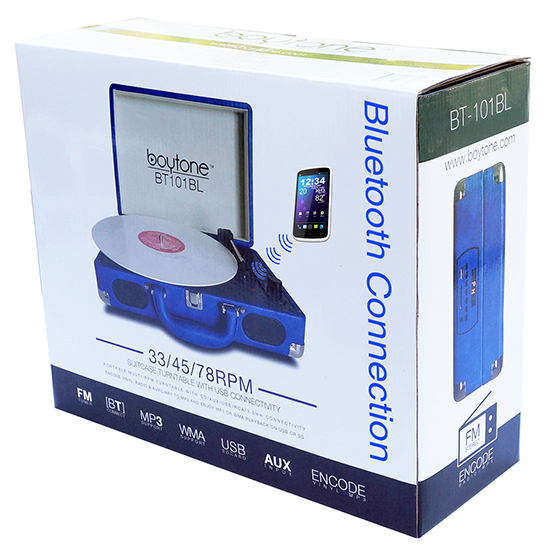 Boytone BT-101BL is accessible with 33, 45, and 78 RPM record, into MP3s via the USB or SD ports. It also converts vinyl to MP3 format without a computer. No special software needed. It’s easy to operate. The BT-101BL will handle media from almost every generation. And with a 3.5mm auxiliary input jack, you can also connect your iPod, iPhone, iPad, Android cell phone, or virtually any other digital music player with a headphone jack. The BT-101BL includes a LCD digital display, for the ultimate combination of old and new, with a black color finish. Also comes in Black, Red, White and Light Blue. Dimensions: 14"(W) x 10"(D) x 5"(H) Product is backed up with 1-Year direct Boytone warranty and ships immediately from USA.